This week, Jews around the world will once again read the Purim story from the Megillah. As always, we will cheer Esther's bravery and blot out the name of the evil villain Haman with boos and noisemakers. But an extraordinary archaeological discovery of just six months ago should change the way we understand the character of the Persian king, Ahasuerus. I, Ahasuerus, King of Persia and Very Stable Genius, have profited bigly from my collusion with King Badanov, paving my way to a landslide victory in the Persian election of 247 BCE. But hey, no one can prove this, so it will always be Fake News and for anyone who suggests otherwise--well, know that they are laughing their asses off in the Carpathian Mountains over how the Farsi Bureau of Investigation (FBI) has handled this investigation. This amazing textual discovery should not stop any of us from laughing, singing, and stomping our feet as we read the Megillah here at CABI on Wednesday night. But to honor Ronen Mueller's revelatory work, I suggest that this year, upon reaching the Megillah's end, we all drink a White Russian or two and toast "L'Chaim!" --or "Nostrovia!" --to King Ahasuerus and the bots who put him in power despite his losing the Persian popular vote. Jewish tradition warns against invoking a vain blessing, which it calls a b’racha l’vatala. The Talmud insists that prayerful words should matter deeply, and we diminish their power when we utter them falsely. Let me offer a few examples. Expectant parents should not pray for a boy or a girl, since we know that this is genetically determined at conception and one’s prayers and petitions cannot change that reality. Similarly, upon hearing a siren or seeing a fire truck passing by, one should not pray: “Please, not my house.” It’s already a done deal—and besides, such a prayer implicitly wishes the ill to be upon others. One should instead pray for the health and welfare of all concerned, wherever the crisis is unfolding. Finally, one should not offer a blessing over bread and then decline to eat. To utter the words with proper intention, one must follow through on the action. I’ve thought a lot about this principle in the days following the horrific school shooting in Florida. Once again, we’re hearing the usual litany of Republican politicians—starting with our president—offering up their “thoughts and prayers” for the victims and their families. This is the epitome of a vain blessing, which only cheapens genuine prayer. This expression, coupled with these politicians’ adamant refusal to take any significant action to stop the bloodshed, makes an utter mockery of faith and decency. Yes, we can and must grieve. And pray. But our grief and prayer should compel us to act. We must not acquiesce and accept America’s gun violence as normal—because it isn’t. Nearly two dozen children die of it each day. This is unprecedented in the developed world—appalling and unacceptable, because it could be significantly curtailed with legislative action. 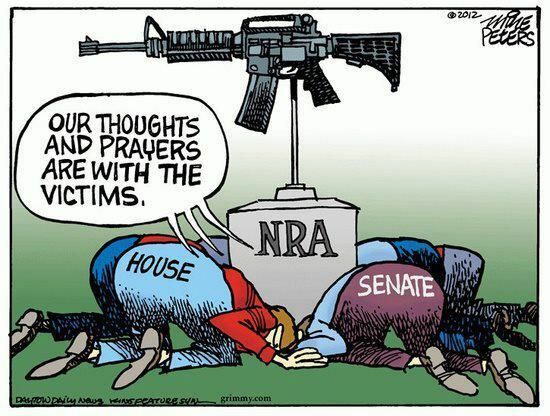 It is a sham and a sin for us to offer our thoughts and prayers while supporting the obstructionist efforts of the National Rifle Association, continuing to allow the purchase of assault rifles, and making guns easier to attain and use than a license to drive a car. Such hypocrisy is the vainest of blessings—a slap in the face of the God of Life. How we have betrayed you yet again! when our passivity is already breeding doom for others. Don’t pray for the victims, act! and the fanatical phalanx of their apologists. At first glance, the opening of this week’s portion, Terumah, is Torah’s strongest argument on behalf of synagogue capital campaigns. God asks the Israelites to bring donations for the construction of the mishkan—the portable sanctuary that the people will carry with them through the desert. What follows is the most successful fundraiser in Jewish history: the Israelites respond by bringing such an abundance of precious metal, gemstones, fine fabrics and other materials that God ultimately has to tell them, “Enough—stop giving!” I’ve never heard of this “problem” reoccurring. Yet I would argue that upon a closer reading, the parsha actually endorses a very different type of campaign. This shift begins with asking the (somewhat) obvious question: Why does God need a building in which to dwell? Isn’t the Divine at least potentially everywhere, beyond space and time? Why construct a “house” for the Source of Life? There are scores of fantastic, vital synagogues that are thriving without a building of their own; there are also myriads of synagogues with spectacular buildings that are withering away. What matters most is not the structure but the community that creates it. We should take rightful pride in our historic synagogue building and our beautiful classrooms, kitchen and social hall. But we must not forget that the beating heart of CABI is not a building; it is the people who occupy that building—and whose Jewish lives do not stop there. We need to be living our Judaism in our homes and all over our city. Toward the end of next month, for instance, we will be celebrating Shabbat downtown during Boise’s Treefort Music Festival. This is an opportunity to meet people where they are and bring a Jewish component to their Treefort experience. I hope that in the coming months and years, we will look to reach out beyond our CABI campus more frequently and more ambitiously. The sanctuary in our portion is, after all, portable. We can’t move our building through the desert (even though we did once!) but we can expand its reach by teaching, celebrating and living our Jewishness in all the places we inhabit. Once we recognize that in this portion, the way you build matters much more than what you build, we might read it as a potent injunction to launch a human capital campaign. If our greatest asset is our community, then we should focus on listening to one another, on empowering ourselves to do Jewish together. When we encourage and inspire one another—well, that’s when the Divine truly dwells among us.